The Old Schoohouse Magazine recognized BHI for the outstanding curriculum, Spell to Write & Read, a unified language arts program for all ages and learning styles. Homeschool blogger says, "SWR is used in public and private schools, in many homeschools, and is a favored choice for EFL (English as a Foreign Language) tutoring for dyslexics, and adult literacy programs. Students who have failed with other spelling and reading programs find success with SWR." 2. 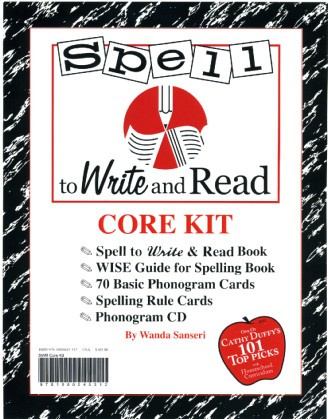 Spell to Write & Read Honored as Top Pick Twice in 2005 & 2012! Reviewer Cathy Duffy in 2005 selected the SWR program as one of her"100 Top Picks for Homeschool Curriculum." She renewed the honor in the second edition of her book,"101 Top Picks!" 3. Spell to Write & Read Chosen First Place in Spelling Again in 2015. This is the fourth time that SWR was voted first place for satisfied users in the Practical Homeschooling ® Reader Awards in either spelling or phonics and as of this year the fourteenth time SWR has placed in the top three. 4. Spell to Write & Read Recognized for Excellence in two areas in 2012! TOS surveyed the homeschool community through an E-Blast and social media, and the best of the best in almost every area of study have been chosen. The survey was designed so that individual respondents entered the name of a curriculum or product of choice for each category. They were not given a set of choices from which to choose. Consequently, the winners of the TOS 2012 Excellence in Education Awards were clearly chosen by the respondents, and the respondents were not constrained by the crafters of the survey. After all the data were amassed, category totals were calculated and the winners determined. Spell to Write and Read won second place in two categories: LANGUAGE ARTS, and also - READING and SPECIAL NEEDS. LONG AWAITED NEW BOOK RELEASE! Suggested Book List by Gary and Wanda Sanseri uncovers book treasures. Books mold minds. The challenge is finding good ones. For ordering information click on the blue side link "BHI Publications" and scroll down to Suggested Book List. The Spell to Write & Read author shares the four secrets to Language success that have made her material an award winning program. You can also find a link to other endorsed SWR YouTube selections at Related Sites and Links. You can reinforce teacher/student drills of the 70 Basic Phonograms with our easy-to-use apps for Android or Apple. Select a preset order, a scrambled order, or a tailored list of phonograms for up to four different students. Adjust speed as slow, medium, or fast. Connect to the apps from our blue side bar page link called "Related Sites & Links." Cursive First? Is Teaching Latin a Fad? We are delighted to announce a tailored replacement for the stock, blank-line, black composition notebook. Spell to Write and Read students build their own “text book” for logging in what they are learning each year. Now, students (3rd grade and up) can focus their energy on content. No more need to format, fold, title, or number pages. The new log expands important concepts: spelling rules, grammar, derivative work, vocabulary. 3. Check out our Discounted Materials page for special sales and discounts. WE ACCEPT ALL MAJOR CREDIT CARDS VIA OUR EASY TO USE SHOPPING CART! Thanks for shopping with Back Home Industries! Your business is very much appreciated!